With the Southern California drought raging on (although there may be an end in sight), we are getting an early look at Fire Season, with the Summit Fire in Big Bear hurting air quality and damaging acres of wilderness. The Summit Fire has also affected Big Bear football. Coach Dave Griffiths said that the school didn’t have classes yesterday. The team still met and had film sessions. Today (Tuesday), there was also no classes, but the team did practice, albeit inside. Griffiths said that Saturday afternoon’s season opener against Excelsior at Big Bear Middle School has not been affected yet. However, the fire is near the Middle School, so that’s a distinct possibility it could be moved at this point. 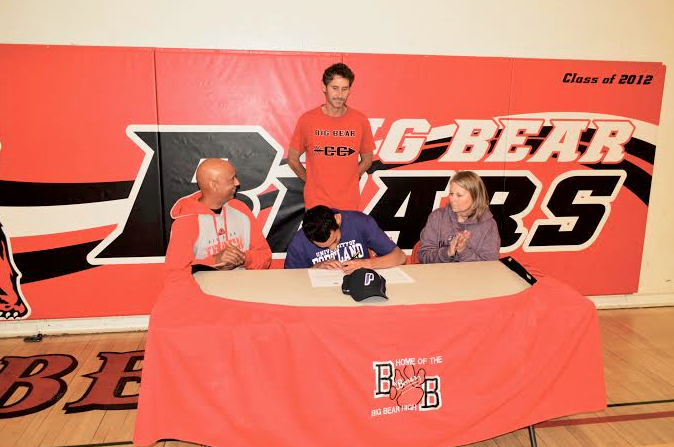 In recent years, Big Bear has moved home games to Barstow High, or more frequently, to Lucerne Valley. Big Bear’s Caleb Webb, the Sun’s Cross Country runner of the year, has erased one of Big Bear’s legendary runners from the record books. Webb ran the 3200 meters in the invitational race at the Arcadia Invitational on Saturday and ran a time of 8:52.17, incredibly not good enough to win. It only placed him third, but only .27 of a second behind the winner. He was the top Californian in the race and in broke the school record in that race, held by legendary Ryan Hall. Hall’s best time was 8:55. Big Bear senior Caleb Webb, after winning the CIF State Division 4 cross country title in November, has been selected to be part of the Team USA Junior National Team. Webb will leave next week for Ediburgh, Scotland, where he will compete with five teammates with team USA against teams from Great Britain and Eastern Europe, Webb said. He also said it is an under-19 team, so his teammates are all in high school or in college. Team USA will be competing in the Great Edinburgh XCountry on Jan. 10. 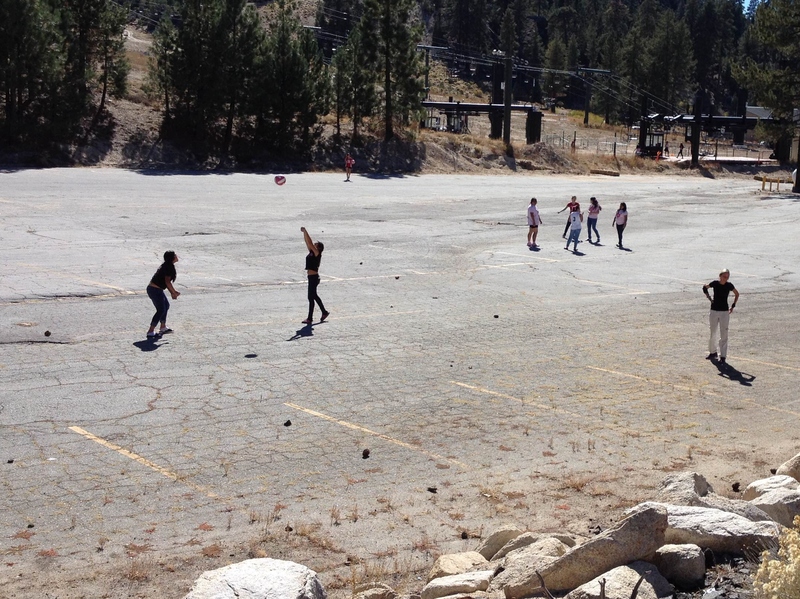 ABOVE: The Desert Mirage volleyball team warms up in the parking lot of the Snow Valley ski resort on Monday, while waiting for Highway 18 to reopen. Getting to Big Bear High School isn’t the easiest thing in the world. There are essentially three ways into the Big Bear area: from the west and San Bernardino, it’s highway 18; from the High Desert, it’s the other end of highway 18; and from the south and Redlands, it’s highway 38. Highway 18 between Big Bear Lake and Snow Valley ski resort has complete Caltrans closures during the day for several weekdays this month. The issue caught several drivers by surprise, including the bus carrying the Desert Mirage girls volleyball and girls tennis teams to Big Bear for afternoon matches. JV volleyball and the tennis were scheduled to begin at 3:15 p.m., but the road didn’t reopen until 3 p.m. The bus didn’t arrive at the high school until about 3:30, delaying the start of both matches by about an hour. Big Bear uses the other two routes to play league opponents, and usually only takes the closed route when playing Rim of the World or San Bernardino schools in nonleague contests.